Road trips might sound fun, but they are usually peppered with boredom, muscle stiffness, too many carb-loaded snacks and some really bad, roadside food. The word going around says that if a truck stop has a parking lot full of trucks, the food will be wonderful. I wish this was true. We have actually gone into such places and been driven out by the grease, smoke and strange people...another part of the adventure. A few years ago, we made an early morning breakfast stop at an inviting looking roadside restaurant. We ordered hashbrowns and eggs. They were the most delicious, shredded hashbrowns I had ever tasted...and noted it in my car journal so we could remember to stop there again. On a return trip, I could hardly wait to reorder that delicious breakfast meal. I should have been forewarned that it would not be the same by the extreme length of time it took for our breakfast plates to be brought out. The meal was entirely forgettable; whatever the previous chef had done to those potatoes had definitely not been passed on to his or her replacement. 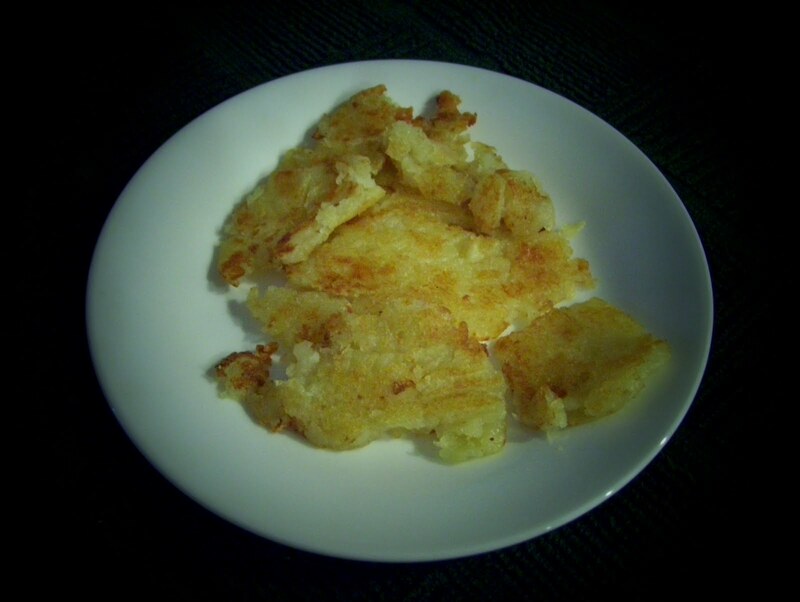 The whole process of making hashbrowns is a sore subject with me as I had never been satisfied with my versions of them. So, I undertook a challenge to try different methods others had suggested that would lead to hashbrown success. The ratings are from F to A...1 to 5...horrible to wonderful. #1. The first recipe came from a book called 101 Things to do With a Potato. 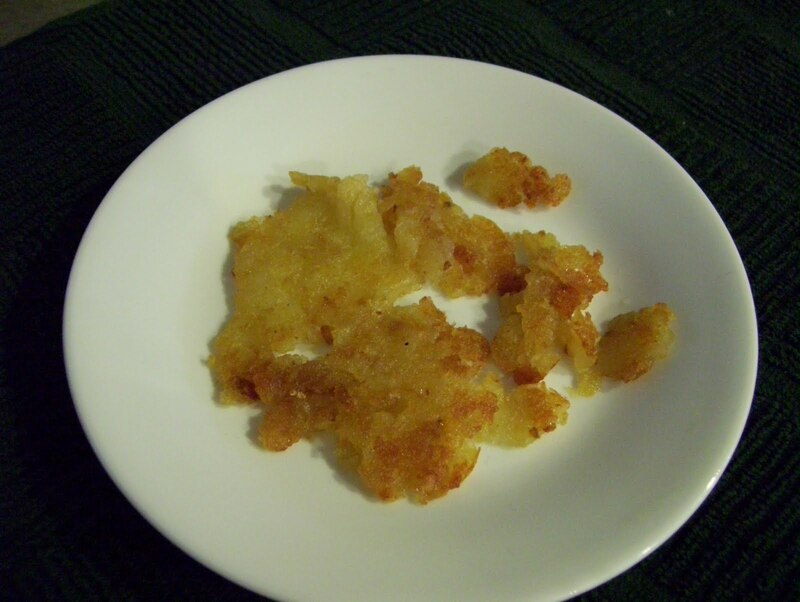 It suggests frying a raw, grated, russet potato with onions and bacon in a covered skillet...I used real bacon bits, and squeezed the water out of the potatoes, (it did not say to do this), before frying with the onions. It took a long time to brown up and the potatoes were transparent looking. 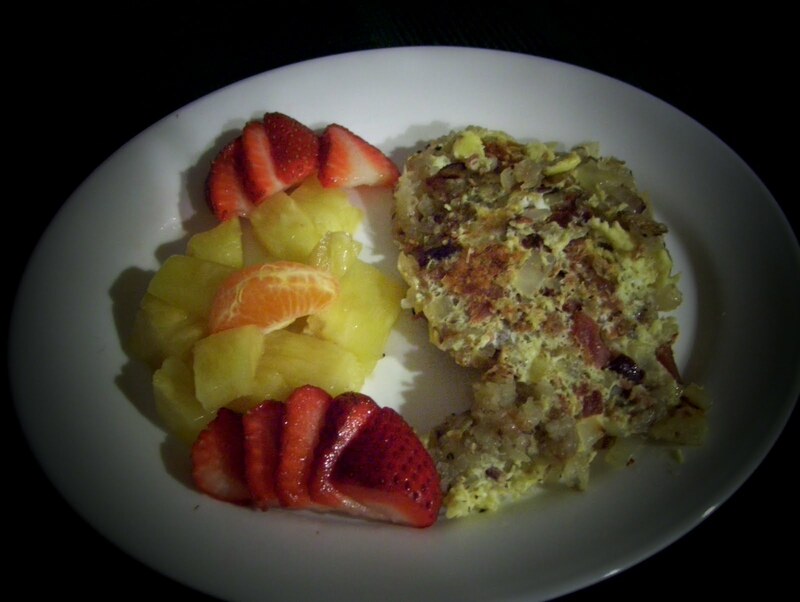 I did add the scrambled eggs and came up with the plateful of food shown above. Rating: C-, 2+, mediocre. #2. Grated, peeled, raw potatoes, no water squeezed out. These took a very long time to cook. The potatoes never browned correctly, they were gummy, transparent globs. Rating: F, 0, horrible. #3. Raw potatoes put through a potato ricer to extract the maximum liquid. Fried up with margarine, both sides. These had an acceptable texture and the taste was good. The downside was the grease and length of time it took to cook...20 minutes... and they were slightly transparent. Rating: B, 3, Not bad. #4 Partially cooked potatoes, peeled and grated. 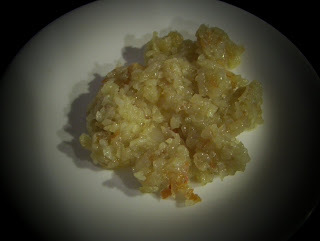 #5 Fully cooked potatoes, peeled and grated. 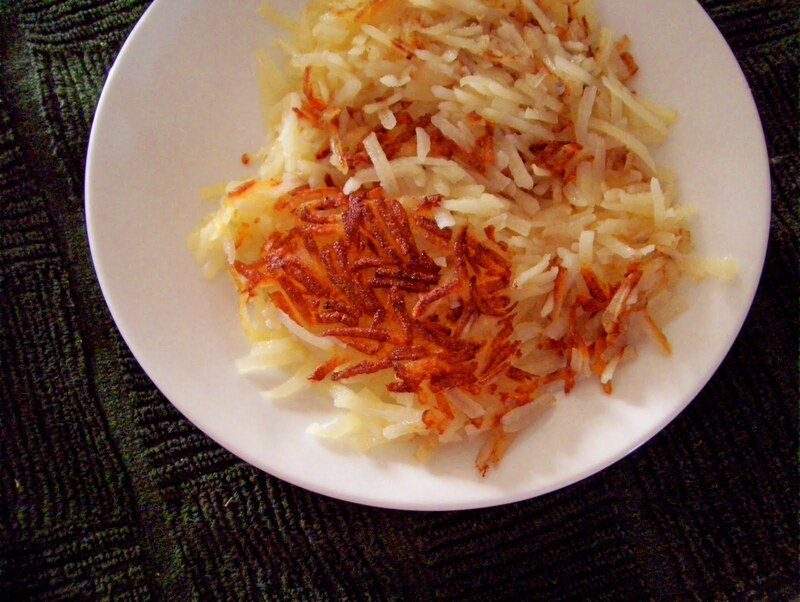 Both of these methods turned out hashbrowns that were more like fried mashed potatoes. They did not taste like shredded hashbrowns, but were not bad. Rating: C+, 2.5, OK.
#6 Last of all, I used a commercial dried hashbrown product that had to be reconstituted with boiling water in the carton in which it was packaged. 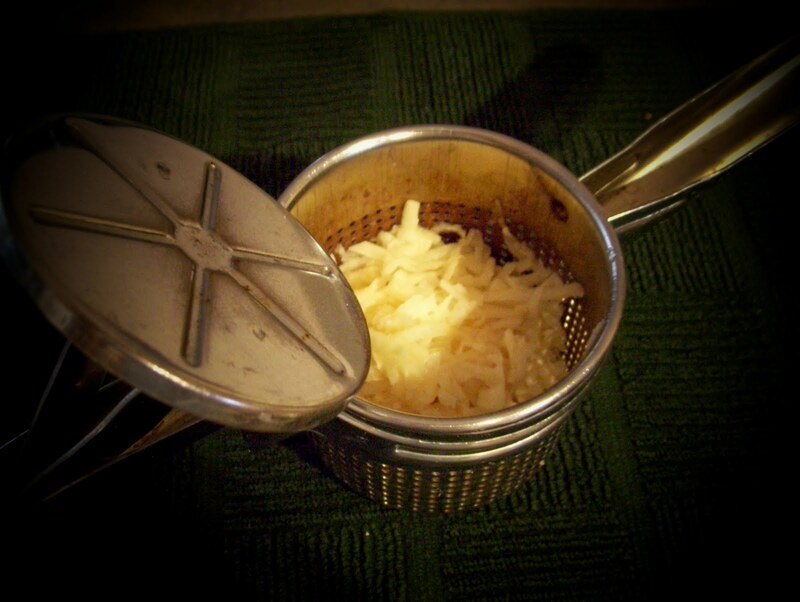 So easy, no grating. 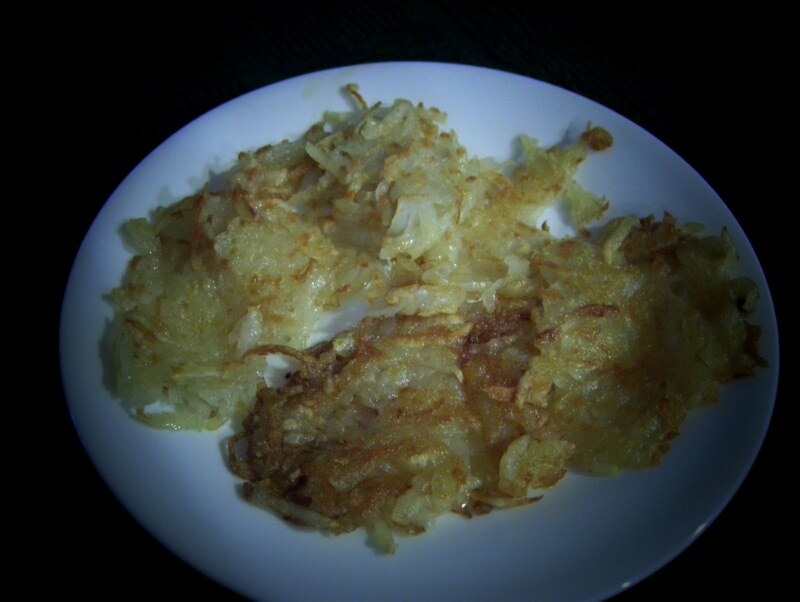 The potatoes fried up in a very short time and actually looked like hashbrowns. I made these on a traditional teflon griddle and the result was edible, but not wonderful. The next attempt was an act of desperation...I was at my hashbrown edge! I pulled out a very cheap pot...stainless steel with a copper cladding on the outside of the bottom. Oil and margarine were added to the pot which was on med. hot heat. I put in the commercial hashbrowns and patted them to cover the bottom of the pot evenly. The package directions said to only cook one side and to do that for 3-4 minutes. The results almost made me jump up and down. With a little salt added, I was ready to taste. They had a wonderful crunch on the top side and were tender on the bottom. The potato flavor was real and they were not greasy...A...5...Wonderful! The hashbrown product I used was Golden Grill Russet, by Basic American Foods. They generally sell to restaurants...which is probably why I loved the potatoes at that truck stop...I bought these at a Costco. I have not seen them on the shelves lately. The website for BAF indicates that some Costco and Sam's Club stores do have the product. I have sent BAF an email requesting more information. Will pass it on when received.